Experience the worry-free atmosphere of Cedar Creek Lake while staying at this updated 3-bed, 2-bath vacation rental home! With sleeping for 10, an abundance of outdoor amenities, and 264 feet of water frontage, this getaway is ideal for families and friends who want to see what lakeside living is all about. Whether you're renting the available speedboat to go wakeboarding, fishing off the private dock, or simply lounging by the fire pit, you're sure to be all smiles at this Star Harbor retreat! Make your way through the vibrant greenery of Star Harbor to discover this newly remodeled home boasting 2,400 square feet of living space. The front room features a foosball table and game table, making it easy to spend quality time and have fun with your loved ones. When you're in need of a little R&R, flip on the gas fireplace and kick back on the L-shaped sectional sofa to stream your favorite shows. There is a 65-inch flat-screen Smart TV in the living room and a 55-inch flat-screen TV with Roku in the bunk room. During downtime, you can also head to the sunroom located off of the deck - the perfect place to warm up while reading, stretching, or doing yoga! As the group grows hungry, relocate to the fully equipped kitchen to create a 5-star meal! The cooking space is stocked with everything you need, including a 6-burner stove, 2 ovens, and essential cookware. For those who are grill masters, a built-in natural gas grill and smoker await outside! Neighboring the kitchen is the dining area offering abundant seating, or you can savor meals on the furnished deck or dock! The outdoor space is brimming with several more amenities, including a fire pit, hammock, 2 boat lifts, and a "party dock" with power and fishing rod holders. Outside you'll also find a 4-foot tall chain link fence on both sides of the backyard. An added perk of this home is that is boasts not one, but 2 driveways! There is plenty of parking with the first double-car driveway and a second driveway that can easily accommodate trailers. After a long day on the lake, retreat to the master bathroom for a relaxing rinse in the walk-in shower or soothing soak in the garden tub. Climb into the sumptuous king bed and drift toward a deep slumber knowing that your travel companions are fast asleep in the second and third bedroom. With 264 feet of water frontage, you'll surely want to spend most of your time in the backyard! 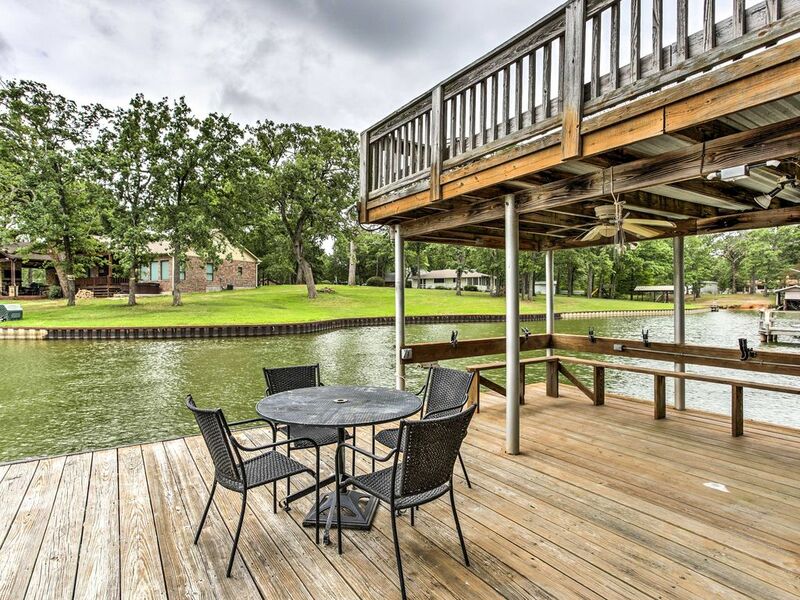 Bring a speaker to pump some jams while you fish off the 2-story private dock, dive into the invigorating waters of Cedar Creek Lake, or simply bask under the balmy Texas sun on the patio furniture. Available at an additional cost is a 10-person speedboat, so you don't have to worry about renting one to go water skiing or wakeboarding! If you brought your own, launch it at the Star Harbor Boat Ramp just 3 minutes away and easily store it in one of the 2 boat lifts at the property after a day of watersports! Golfing enthusiasts will be delighted to have the Star Harbor Golf Course within walking distance. Take a short 0.4-mile stroll over to the beautifully maintained fairways to practice your swing! If you don't feel like cooking, pop over to Ochoea's Mexican Restaurant for some enchiladas! The city of Athens is also close by, home to numerous eateries, breweries, and quaint shops. - Amenities include a fully equipped kitchen, a 65-inch flat-screen Smart TV, 55-inch flat-screen TV with Roku, 12' shuffleboard table, free WiFi, 2 gas fireplaces, central heating and air conditioning, linens, towels, a front-load washer and dryer, complimentary essentials, private entrance, hair dryer, carbon monoxide detector, smoke detector, 2 driveways, and more! - Outdoor amenities include a furnished deck, a built-in gas grill and smoker, fire pit, hammock, private 2-story "party dock" with power and fishing rod holders, patio furniture, a ladder into the lake, 2 boat lifts, and so much more! - Unbeatable Star Harbor Location - Easy access to Cedar Creek Lake, waterfront activities, restaurants, and Athens! The house had been recently updated. Unfortunately it wasn't cleaned well before we got there. There was a fine coating of dirt on the floor with some sticky spots. The coffee pot had left over water in it, the microwave was not clean, and there was a broken window with tape over it. I brought these to the attention of the owner because I would want to know if the cleaning company wasn't doing a good job. They offered to send someone out to clean the next day while we were on the water. I told them not to worry about it. I just went through my credit card bill and found an additional charge. The owners called the rental company stating we took our dog and needed to charge us the pet fee. If I had taken my dog, I would have been glad to pay but I didn't. If I hadn't been reconciling my CC statement, I would have never known they charged me. There was no communication from the owner or rental company. We really liked the property but not happy with the communication or accusation we lied about taking our dog. We rent homes on Cedar Creek 4-5 times a year. If we bring the dog, we pay the additional deposit where required. I've never had this happen before. Truly disappointed. Beautiful home on quiet cove !! Will definitely return!! We have rented 100's of properties over the years and this is one of the best! The house has been completely updated and remodeled and still smells "new". The kitchen has TOP OF THE LINE appliances - never seen this before in a rental. The bedrooms were nice and the bunk room can sleep tons of kids with a nice big tv for all their gaming systems! It also has a second refrigerator which is great with lots of people. The bathrooms are also very nicely done with lots of extra touches and lots of space. One of the best parts apart this property is the gigantic yard. We brought our ENO and hung in the trees, a full size volleyball net and Spike Ball. The kids had plenty of activities and space outside with tons of yard left to run and play. We loved having 2 docks as well. The upper level of the 2 story dock could use some love but I think they are working on that. Tracie was WONDERFUL to work with and very, very nice and helpful. She always answered my questions and had solutions immediately! The disposal backed up on us and she had someone out there within 45 minutes. The AC system is awesome as well.WE love it cold and we never had a problem with that - LOL !! Only suggestion I can think of is possibly dressers and a lamp in the bedrooms. We like to unpack our bags when we stay places and I like to read in bed and not wake up my husband but only had the overhead light These are minor things and I know they just finished the remodel so these items may be coming soon as they may not be done furnishing the house. There is tons of parking as there are two driveways and they are on a cul-de-sac. My kids are teenagers so we had several cars and it was not a problem at all. Patio is amazing as well. They have these twinkle lights and 2 big fans to make it very comfortable in the evenings. We sat out there a lot and were not hot. I would definitely recommend this house. We will for sure rent it again in the future!! Has TONS of perks.